The family and I went to Boston this past weekend. It's not that we live very far away, only 2 hours, but we just don't bother with the trip very often. I went many times growing up, and now it is just so expensive to get there and park, etc. And the entry costs if you do anything are high as well. But, none the less, we drove down, stayed in a hotel 2 nights and took the kids roaming. On the first day, I dragged them to the wonderful north end to retrace part of the Freedom Trail. We went into Paul Revere's home, and visited the Old North Church. 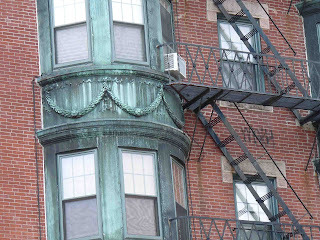 If you've never been to Boston, this area is just splendid - cobblestone streets, old historic buildings, and nearly every restaurant is Italian. How bad can that be? 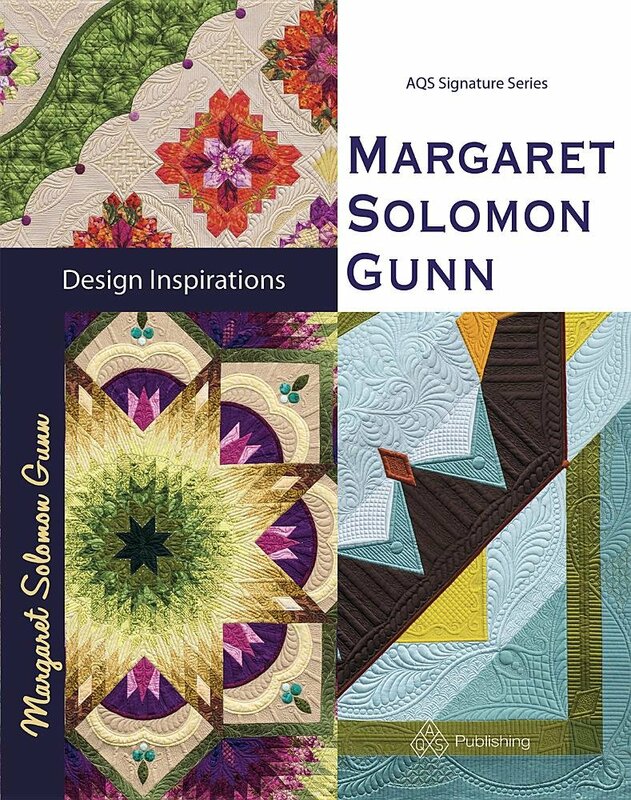 Everywhere I looked, there were quilting inspirations...swags, and fanciful wrought iron (not photographed though), and more. 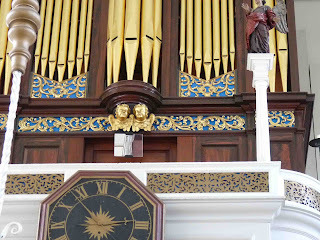 Inside the Old North Church, there was more. 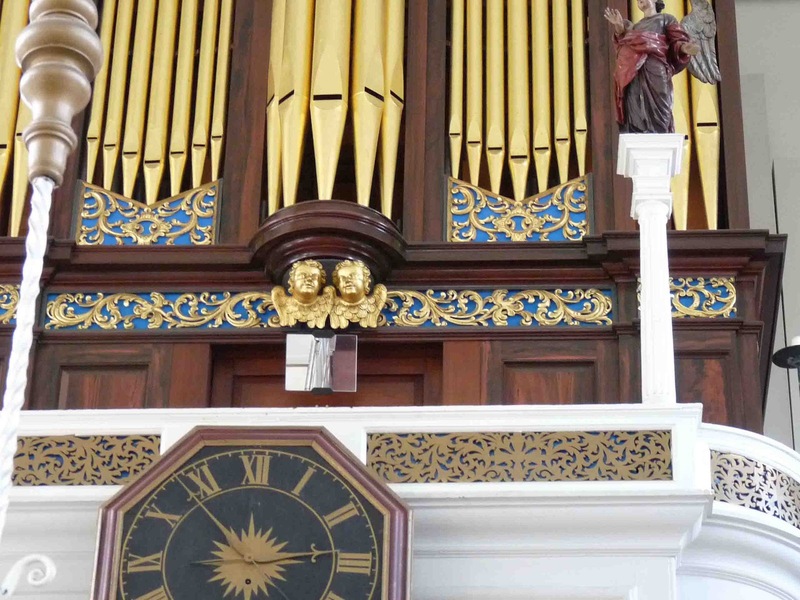 The gold pip organ is gorgeous, but I was seeing nothing but all the carved scrollwork. I can see applique, lots of applique! ...and more applique. 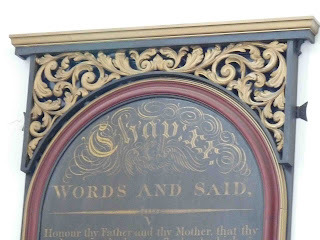 Perhaps I can incorporate some of this on an art nouveau piece that is started. 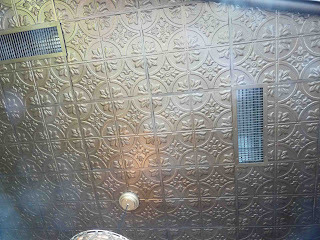 The ceiling in the restaurant where we ate had this lovely tin. 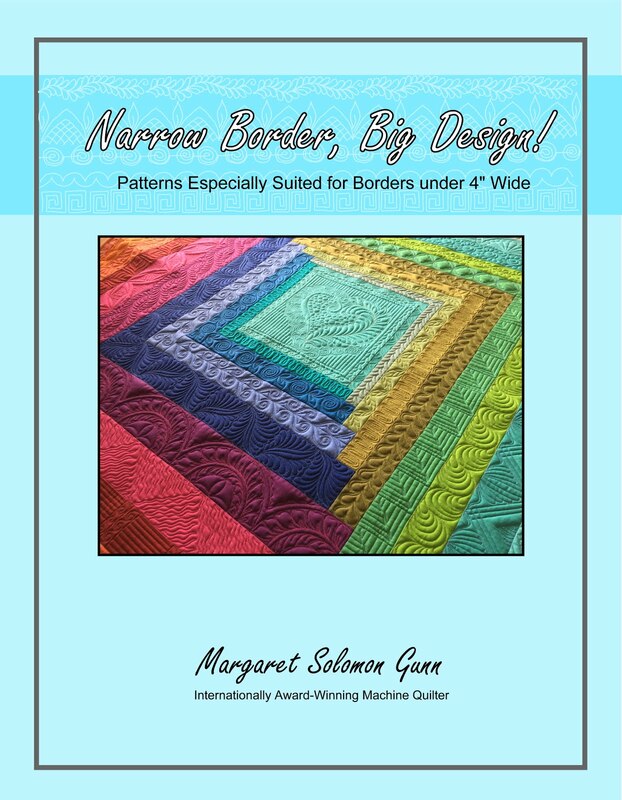 If that's not a quilt pattern, then what is?? On Sunday, we took the kids to the Children's Museum. 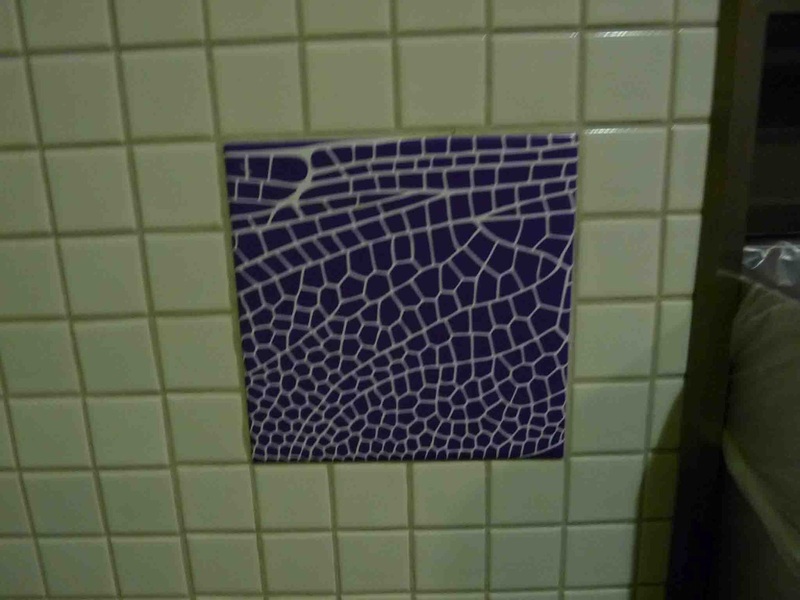 These were some of the wild ceramic tiles on the wall of the bathroom. There were several, and they are intended to look like things in nature that have been magnified. I think this was a dragonfly's wing. They were really cool. I quilted this for a client a couple weeks ago. It is a lap quilt made from 2" squares -- nearly 1000 of them. Although they all look different, which was fun for me to spot many fabrics I have used as well as many I'd love to have had, it did have some repeats. I can't even imagine having enough fabrics to make them all different. Because it is very busy, it's quilted with a simple Terry Twist. It softens the strong geometric lines, yet is still reasonably quick (ie, not a custom) to quilt. 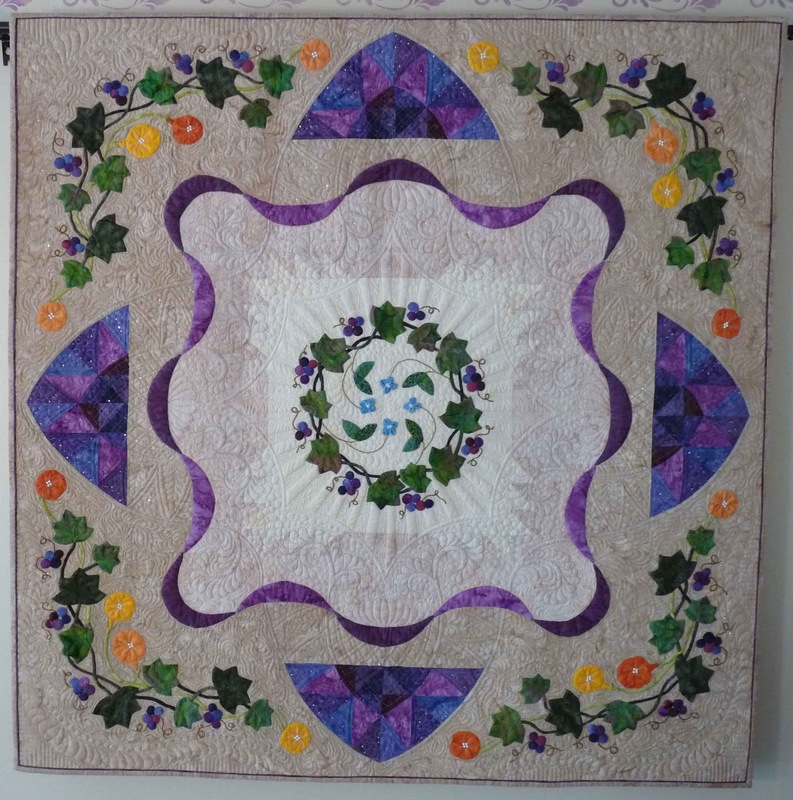 The quilt has lovely, yet simple texture to contrast with the very busy colors and patterns. I love the idea of making a quilt like this to remember my kid's clothes, but still can't get past the fact that there are 1000 squares to have to cut! With a mere 6 days until regular school days start again, we are off to Boston for a weekend. Not really sure I'm ready or in the mood for 5 of us in a hotel room, and all that eating out (love for others to cook and clean for me, but taking the kids into restaurants really takes away the appeal of it!). It's been a non-vacation summer...I'm totally hoping for next year and a trip to Florida again. We'll be visiting the Museum of Science and Children's museum. If I think I can drag them on the Freedom trail, I may try. Nine days. Can you say that? "Nine days"...that is when I will load this and start quilting. I have spent quite a few hours this past weekend, and a couple of the blue wash-out pens, marking this quilt. Normally I don't waste so much time marking, but this quilt is huge. And I just can't be trusted to remember what I did on the top half when I actually get to the bottom half! 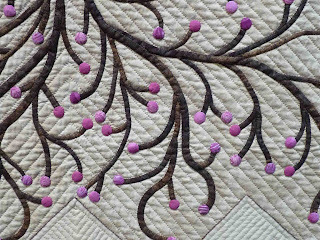 I have several "types" of motifs that I like to use on my quilts. For that reason, I have spent a goodly amount of time trying to dream up different things for this one. I am creative, afterall, and I know that I don't have to quilt the same old thing every time. It is challenging, though, getting away from things that I have seen done successfully, and that I really like. The 6" outer green border is getting a fun wavy feather, that has a stripe that weaves in and around it. I'll probably vary up the feather a bit, adding curls and a few leaves. 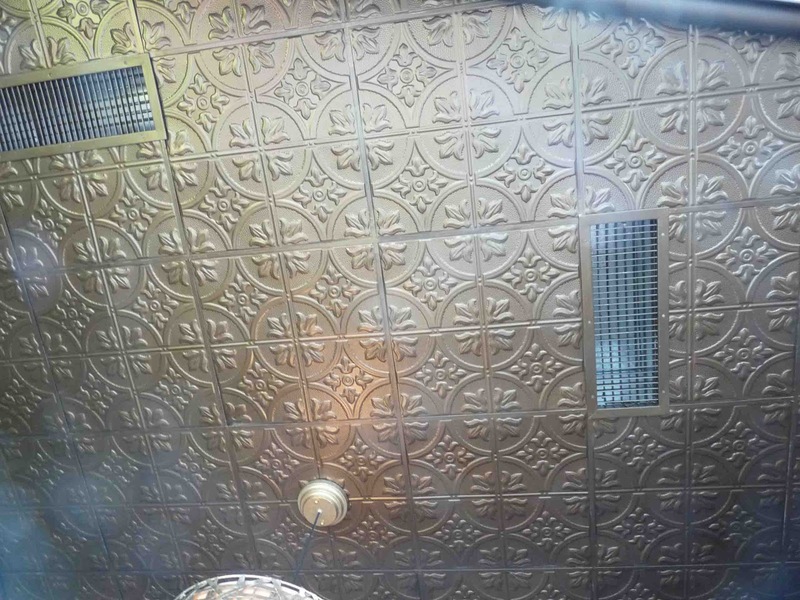 Somehow, it just looks a bit sterile in the picture. Once I see how the silk thread looks on the green, I may also do the stripe in another color so that it shows more. The corners of the quilt are pretty large - nearly 40" on a side. 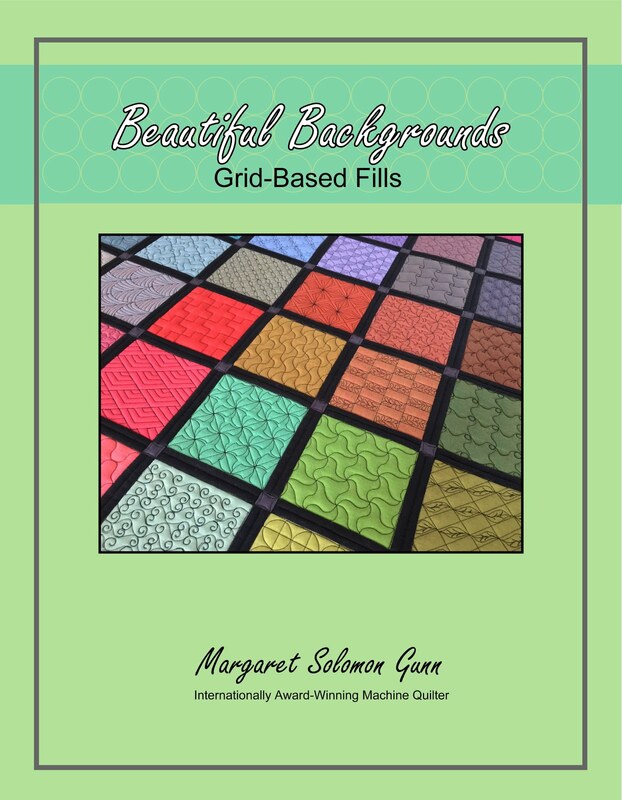 It's enough blank space to send a quilter running for the hills. I have subdivided this a little, preparing for a couple areas with fillers, some cross-hatching, some interesting shapes, and all that 1/2" marked area is getting cc'd. I don't generally do this on a small scale on my quilts, so I opted to do so here. 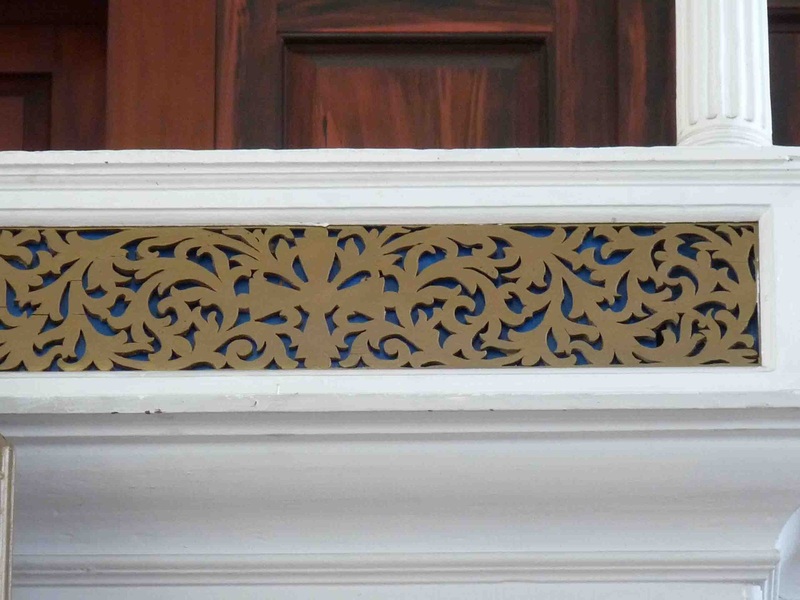 I also designed the motifs going in the white areas. These are feathered with cross hatching in the centers, and some other fill around them. I created this motif a few months ago to go on a whole cloth quilt that I have yet to mark. They seem like they'll be kind of time consuming (heck, the entire quilt is going to be time consuming), but the end effect of a cool design on light fabric will be worth it. 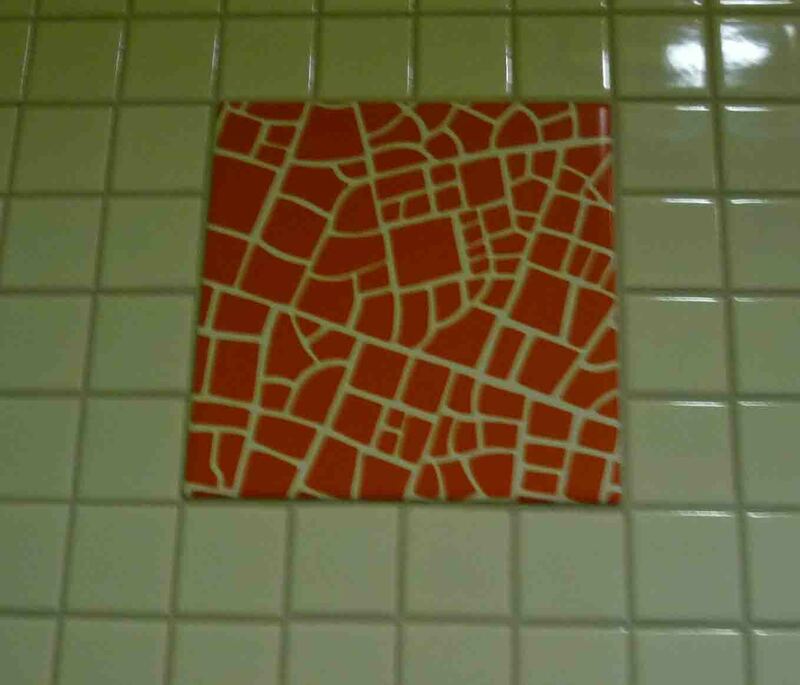 The center motif is different, to draw the eye inward. I know, I know...I use rays on quilts all the time. The fact is, they bring the eye where I want the eye to go. 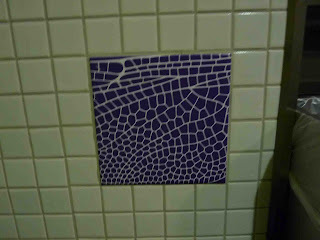 They add visual interest in a way I have yet been able to replicate. This is my original design, created by playing around with repeating feather sprays. There are pages and pages of scribbles and stipple patterns in my house. If I see a pattern on something, I start drawing. 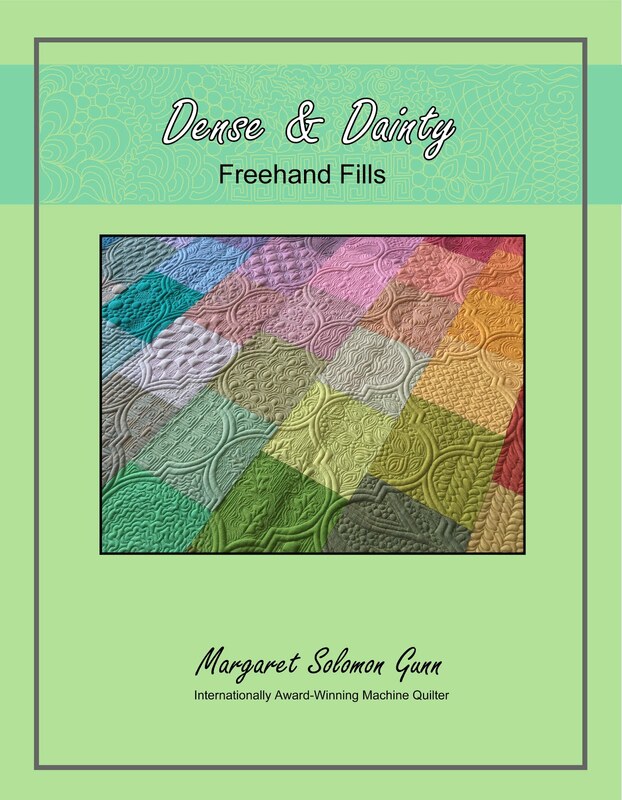 I'm taking 2 or 3 of these to use on the quilt in the larger open spaces. The ones I like best just are not suited for filling tiny areas. Today, the kids get haircuts. New shoes have been purchased, and the drawers are being stocked with unstained, appropriate size school clothes. Do I sound like I am ready?? !...Until then, there are a few more things to finish marking and planning, a 3 day getaway to Boston, and of course, a client has called and is dropping off a quilt this week (to be done Monday). Why is it that right when I am about to embark on a large quilt of my own, I always have another that must be done first??! 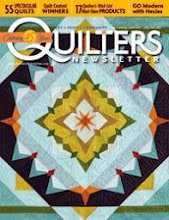 Ah, the life of a professional quilter...no complaints. Then my big green monster will be started. 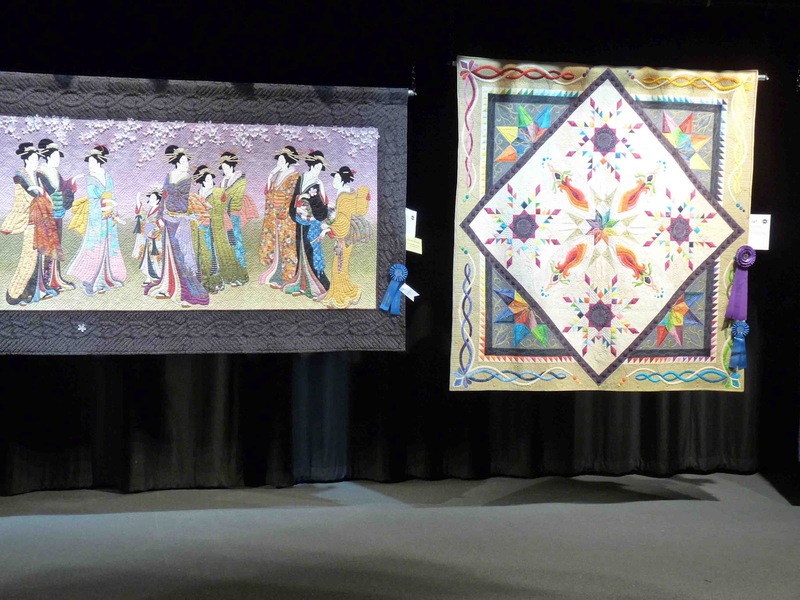 One of the great things about the Lowell Quilt Festival was that it was not just a judged/juried show. 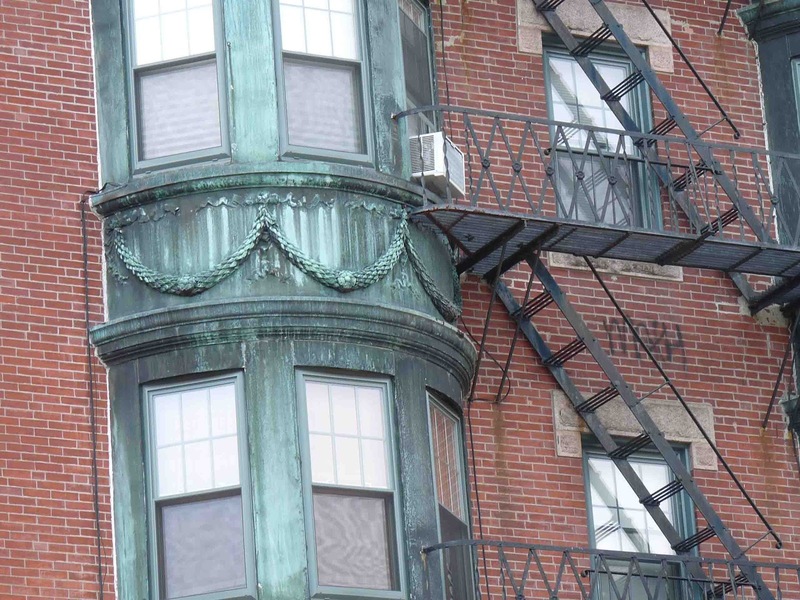 The town of Lowell, which is a former textile mill town, gets involved. They provide a free bus shuttle to get from showing to showing (and there are ~6-8 other smaller shows) -- this year this was great since it started raining. 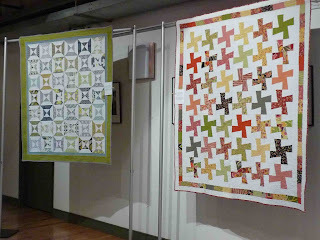 The New England Quilt Museum has a fantastic exhibit which we went to. Unfortunately, they don't allow photos so I can't show you the completely awesome Hollis Chatelain quilt that is there. It will blow your socks off. The current exhibit has many machine quilted pieces, as compared to last year's very traditional and old quilts. 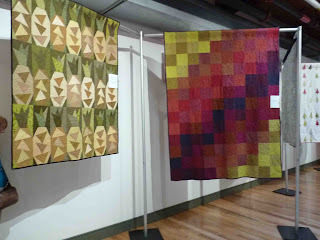 We went to exhibits at 2 other small galleries, both of which had receptions with food, but the one that was truly the most fun was the one put on by the Boston Modern Quilt Guild. It was held in the former Appleton Mills building. The mill has been completely renovated, and is a FABULOUS location - great light, and the architecture is stupendous. 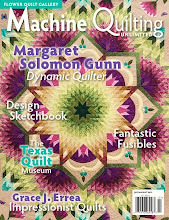 Now, as many of you know, I'm kind of like a deer in the headlights when a truly modern quilt comes to me for quilting. I generally work through the fear and quilt it beautifully, but if given a choice, I tend to stray more to the conservative side, with the use of modern fabrics. So I was caught completely off guard liking this exhibit as much as I did. I came upon the next set of quilts, loving the one on the right. 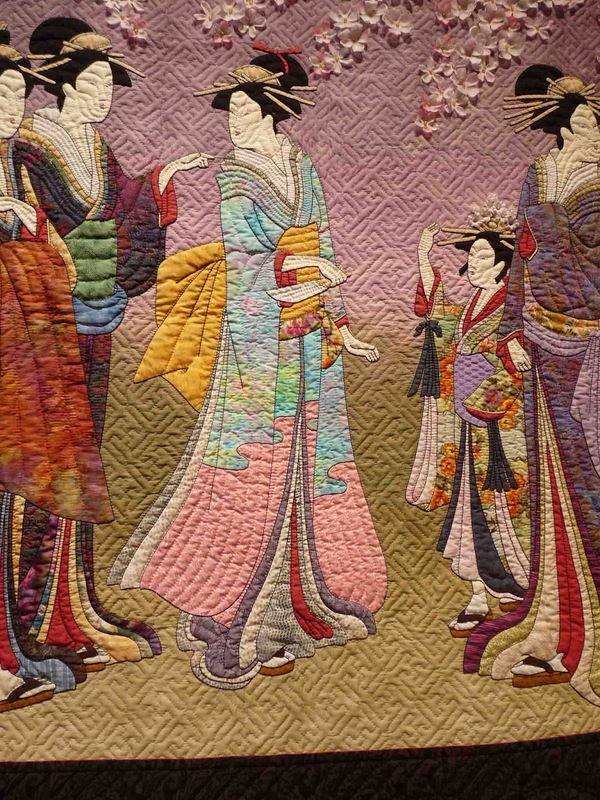 It has fantastic colors, and I said to my mom "I quilted one of those (referring to the one on the left) last year". Ha! Turns out I quilted that very one! It was one of the wedding quilts my client Andrea made. After I saw Andrea's pineapple quilt, I was not shocked to see the pinwheels, which I also quilted. But the surprise was all mine a few minutes later, because I spotted who I thought was Andrea at the front entrance. I've never met her, but her mother (also a client) has posted pictures of her. It was great to finally meet - it was indeed her! As I came out of the restroom, I saw this, and loved it. It's such a fun backing. I am quite a sucker for orange peel quilts. 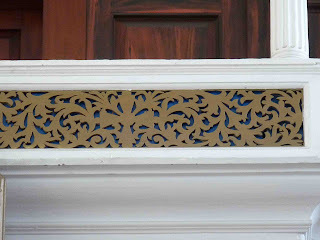 It's the taking of an old-fashioned pattern, and remaking it with a modern twist that is appealing. This quilter modeled her design after a greeting card (attached to the quilt). Here's a shot of the venue. I told you it was gorgeous. Lots of natural wood, steel and light were everywhere. 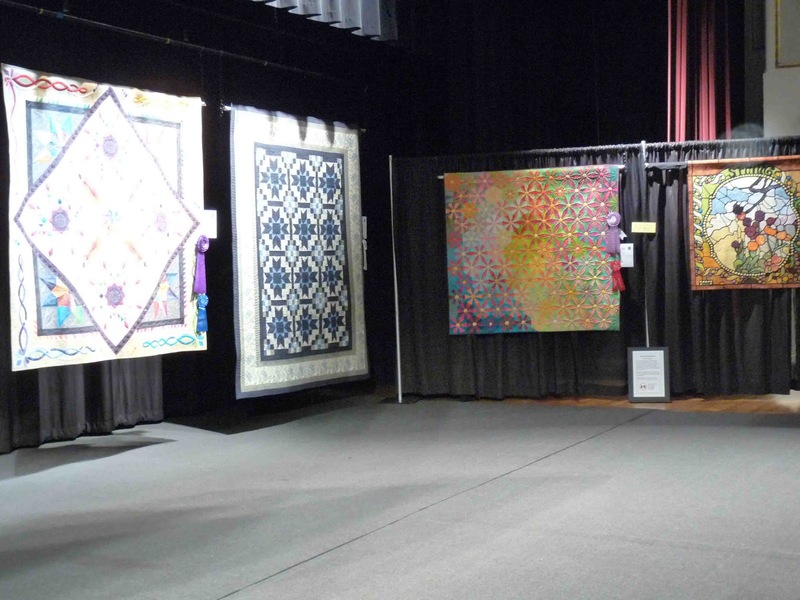 It is SO far superior to the auditorium that the actual quilt show uses where lighting is concerned. Too small to use for the show though. 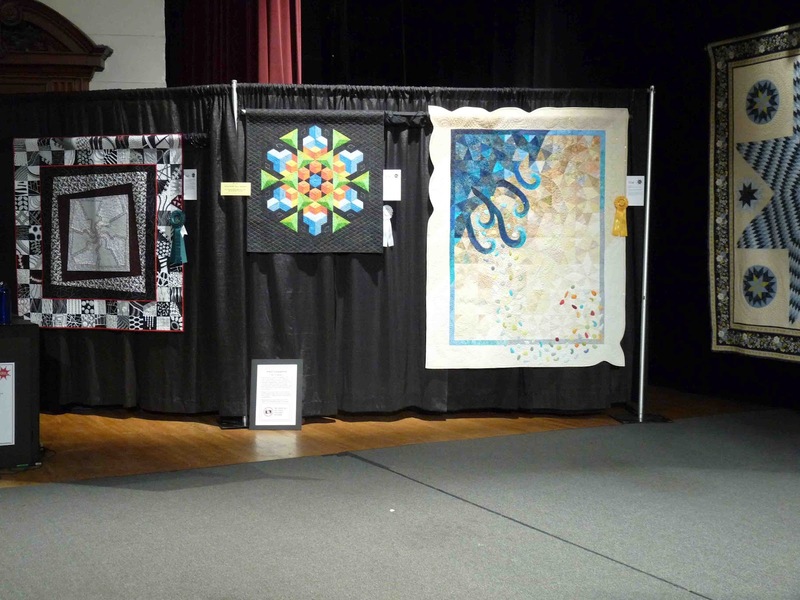 Yesterday, I was able to attend the Lowell Quilt Festival. 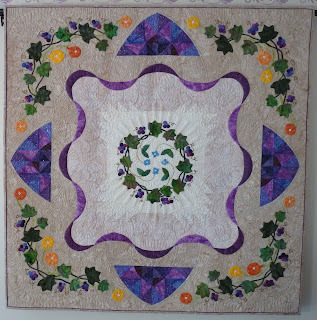 Until a client of mine entered a quilt there a year ago, I didn't even know about it. 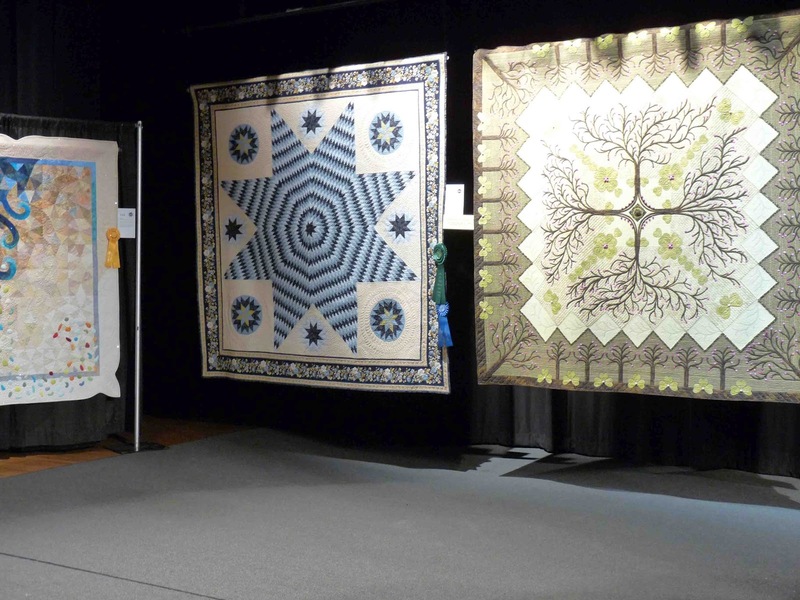 It is not a huge show, having about 80 competing quilts. The caliber of the quilts, however, is generally high. In addition to the judged quilts, there were a couple of special exhibits - one by the wonderful Pat Delaney, a MA-based machine quilter. 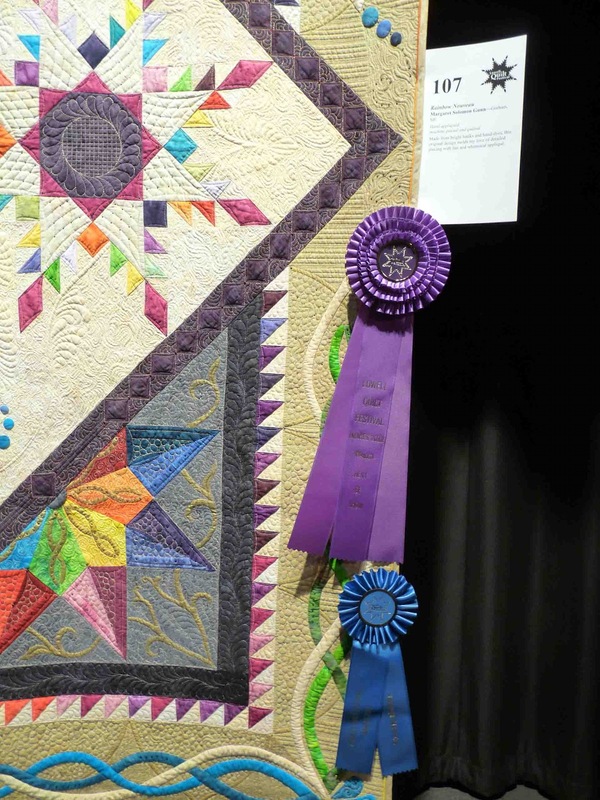 She brought about a dozen of her show quilts, most of which have a bucket of ribbons. The main part of this show is at the Lowell Memorial Auditoriom. While it is a pretty venue for the show, it has dismal lighting and very limited space for vendors. What Lowell that does do that is unique is that they have 6-8 other locations throughout the town that have quilts on display as well, including the New England Quilt Museum. A free shuttle bus can take you around to the various venues. Standiford Star by Herbert Menzel who repeated an 1800's quilt design received both 1st place in the Pieced Bed quilt category and exemplary piecing awards. The next one is Redbud Ramble by none other than Linda Roy. 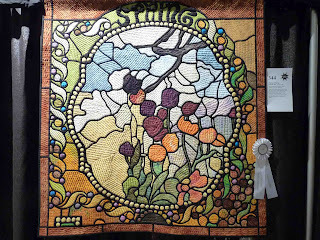 She earned 2nd in the Mixed Bed quilt category and the Exemplary Applique award. More on this in a moment. The next one I have seen before in magazines. Megan Farkas' Sakura I: Hanaogi Views the Cherry Blossoms took first in the Mixed wall category. It's a lovely hand done quilt. I have a closeup in a moment. You all recognize the next one. Yup, my Rainbow Nouveau..my naughty stepchild from earlier this summer. Good news, this one has learned to behave, and rather nicely I should add. 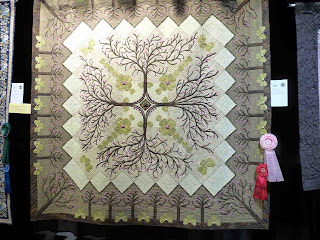 Completely to my utter surprise, this baby took 1st in it's Mixed Bed quilt category as well as Best of Show. Flabergasted! Seeing it hanging on the stage, it is starting to grow on me. Going into the corner is one I unfortunately cannot identify. It hangs beautifully though. 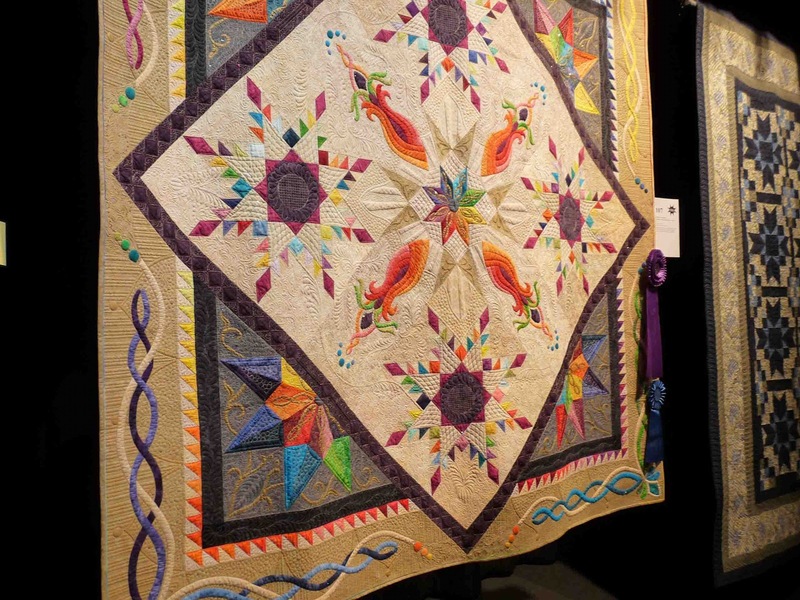 The colorful quilt is Cetena by Timna Tar, a person often receiving awards for good use of color. 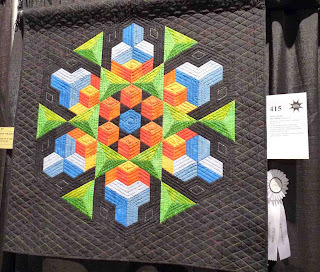 It also earned 2nd in the pieced wall quilt division, despite having a whole lotta appliqued circles on it. Seems like a Mixed quilt to me. 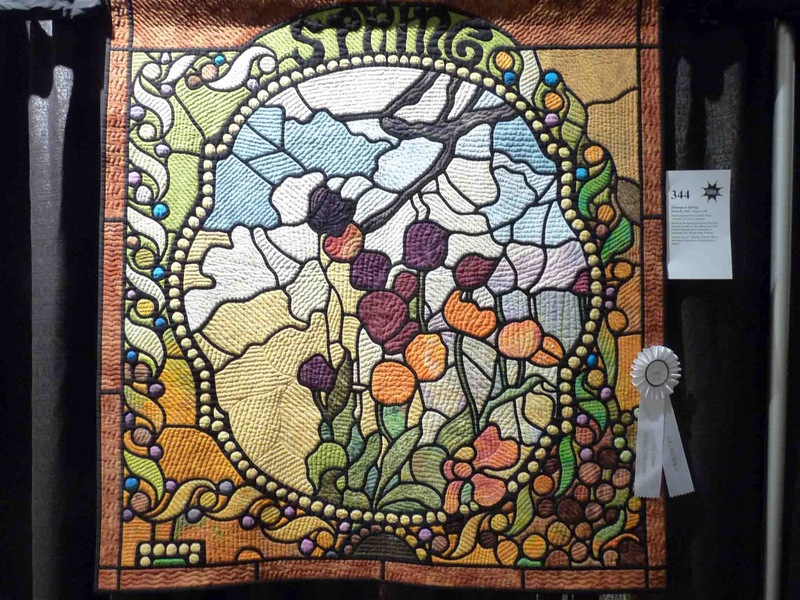 Lastly, Homage to Spring by Susan Ziel (HM in mixed wall). 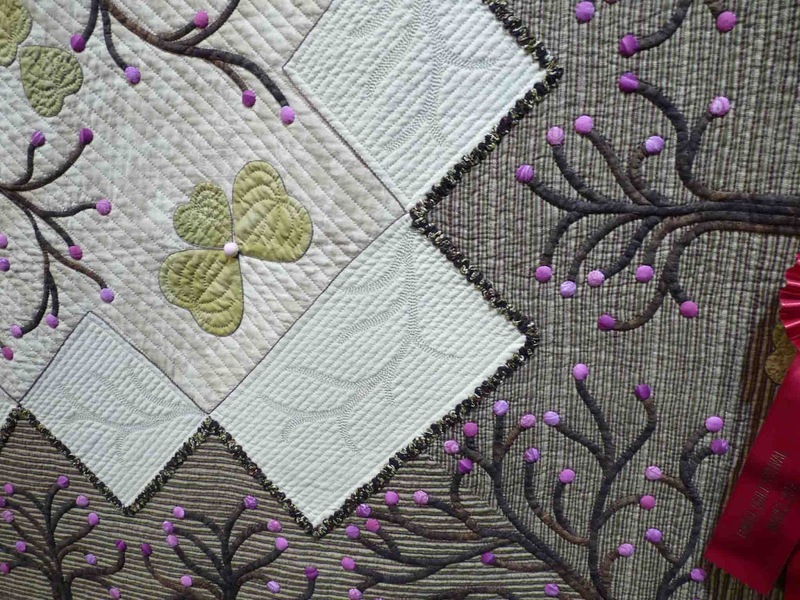 This quilt is truly gorgeous, from the background that softly grades from green to purple, to the delicate detailing on the applique. It is hand appliqued (and if you know me, you know that that's my preference). 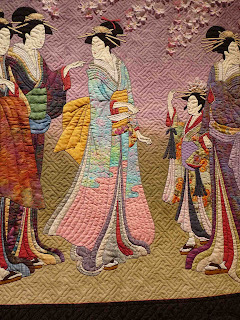 It is also hand quilted, which I also love. Every applique piece is outlined with black embroidery thread, giving them exceptional visibility. It's a trick I will have to stick into my bag of tricks to use someday. 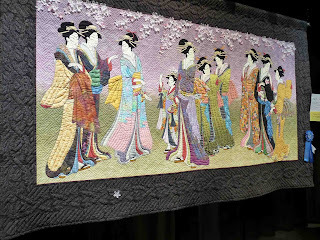 The background quilting, though it is all the same for the entire 60"x90" piece, is period appropriate and effective. Linda Roy's quilts never disappoint. I have seen 3-4 other quilts of her's in the past couple years, and am always amazed. 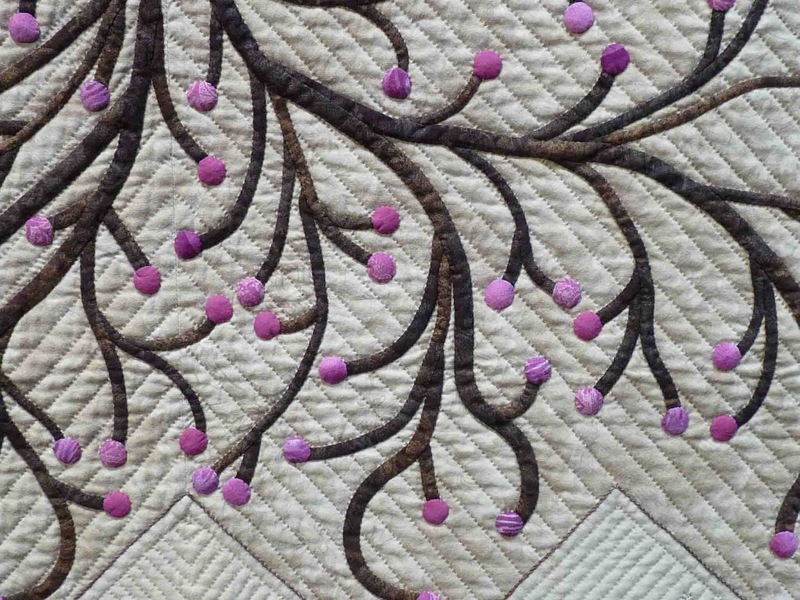 They are often appliqued, heavily, and hand quilted to the heavens and back. Last year, she took Best of Show with her Vintage Button Bouquet. And if I were a judge, this probably would have won this year. Guess it's a good thing for me that I haven't been appointed a judge yet! Like myself, she likes stitching circles (a LOT!) - there must be 750 of the little pink buggers on this! 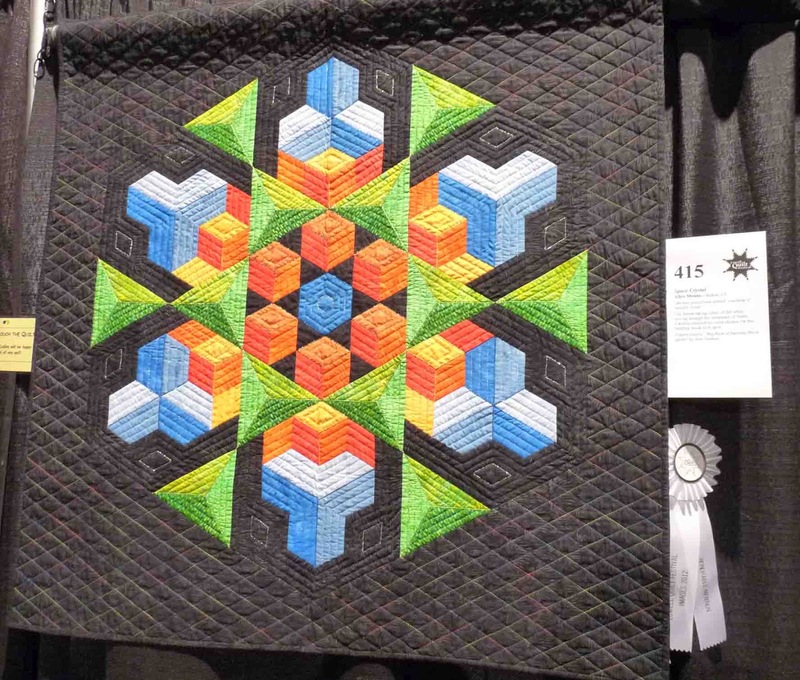 The one thing that still gives me the shivvers, and has since the list of show winners was published Wednesday is that my quilt scored higher than this quilt. How in the Earth? What didn't she do, that I must have done? I am so in awe of what this woman creates. She's such a masterful artist. I just wish the judges comments could tell me what the fine dividing line between her's and mine was. I will forever be elated and grateful for what Rainbow Nouveau is accomplishing and earning, but deep inside me, I need to understand. I know...I am nuts. 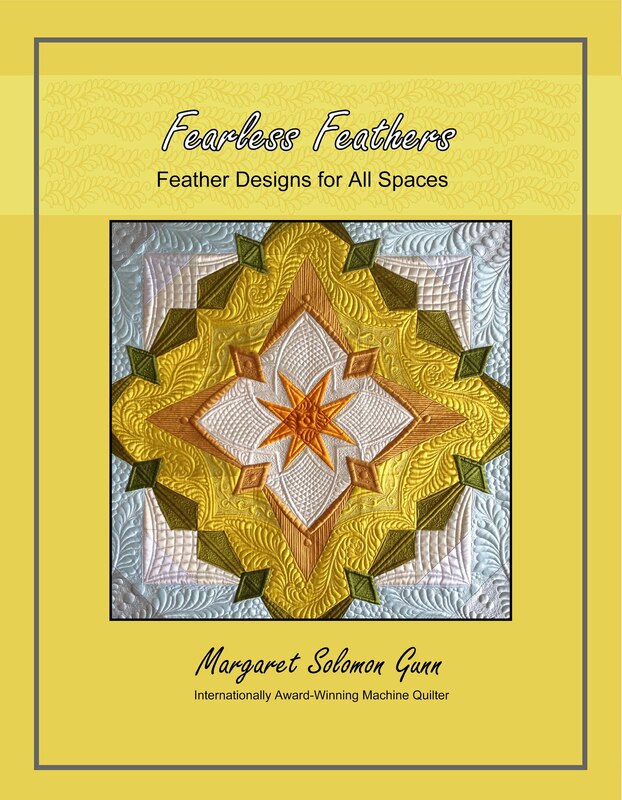 I operate on being rational and logical, and having the understanding helps me to do the right things on future quilts. 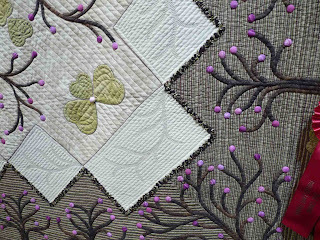 This next one is hand quilted, and is quite lovely up close. And just so you could see this one, I pulled my picture fromVQF (the one from Lowell was dreadfully blurry). The color progressions are nice. 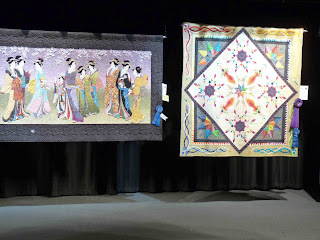 I'll do another post later this week of other show quilts, a couple of the special venue shows including the Boston Modern Quilt Guild's show which was nice. I had the great opportunity of meeting a very good client who I have only known through the quilts she's mailed me. I also had a client from the Boston area that put a quilt I quilted into the show (a surprise until I stumbled upon it!). As FiberObsession commented on my last post, I just wasn't going to be content until I did something to the Dresden centers. I chose this rose/red fabric because it was THE perfect center fabric. And until I dreamed "what if I put a center button and smaller dot" like I was doing on the corners, I thought this 102" quilt was nearly finished. That's me...the consummate dreamer. If it would just end at a dream, life would be easier, or at least faster :-) It's the constant dreaming that makes me a creative quilter. It tests limits and boundaries, and constantly pushes me to consider new and different things. Not entirely bad. Afterall, there's not really a deadline for this quilt. So, I tested a bunch of the green fabrics for the central buttons. I have decided upon the deep check (2nd picture) for at least half of the larger buttons. I think I have another dark green print I will use for the others. So, here's my modern green Dresden quilt. You remember, the one that I ditched last summer/fall when I realized how many other thousand blogging quilters were making one. I chose this design on my own, and even made my own pattern, completely independent of the Modern Dresden crew. 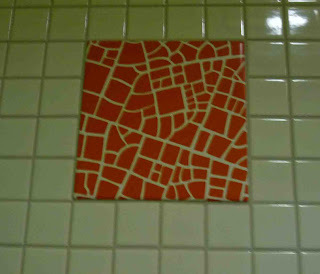 But still, I hate when I am making something that many, MANY others are too, even if mine is considerably different. So, I decided that the outer border needed a punch of the deep rose. It needed 106 half inch dots, to be exact. To date, I have all but about 15 of them stitched on. The corners were a problem all along, and I have been mulling over thoughts to disguise the bulk where the prairie points and mitered joint come together. My first thought was to applique a larger circle over the area. It seemed so promising that I actually did it. And until I did it, I liked the idea...whoops! Good thing I did not cut away the fabric beneath the applique! 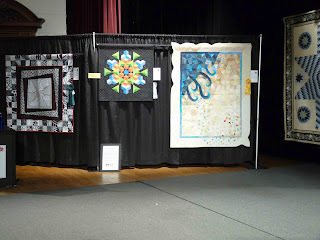 Last weekend, I sent 2 of my quilts to a machine quilting show in WI...Machine Quilting Today Show. 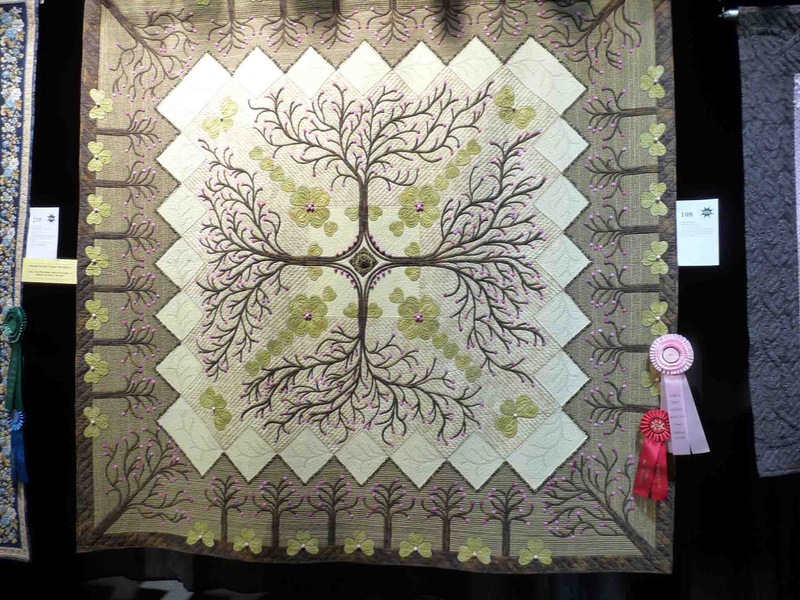 One of my quilts, a small one only 40.5" square, took a 3rd place! I was pretty surprised. This quilt has not gone to too many shows because it's ever-so-slightly too large for the small quilt category, and probably not effectively competitive with larger quilts. 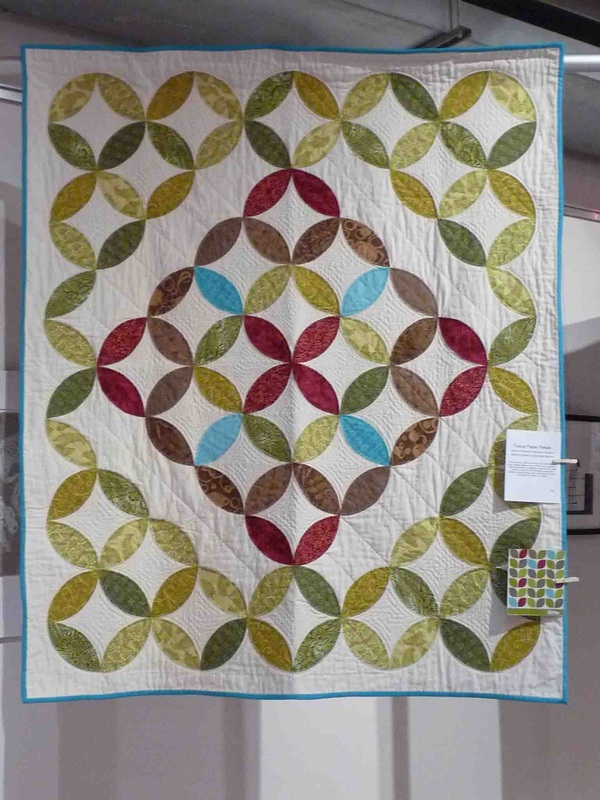 I also sent my Meet Me at Giverny quilt, but it didn't place. Perhaps the judges comments will shed some light on why, or perhaps it was just in a stacked category. I don't know. Time to go chip away on the many applique projects I have in the works while the kids veg in the cool house to Roadrunner and Bugs Bunny.